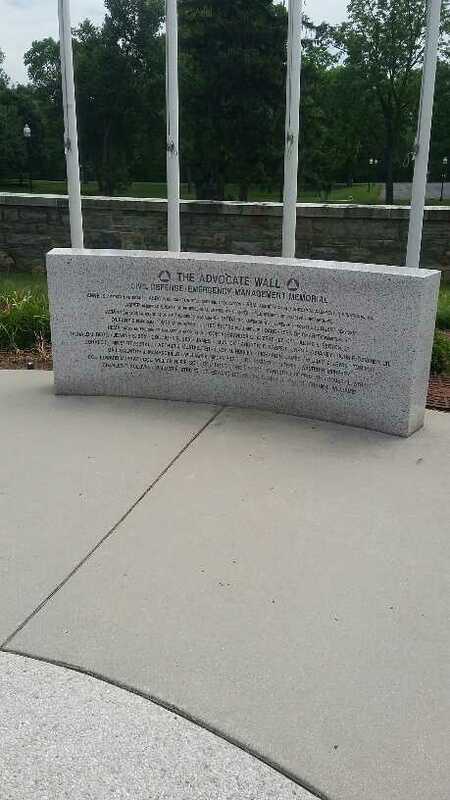 A memorial to the importance of Civil Defense and Emergency Management in defending our freedoms at home. 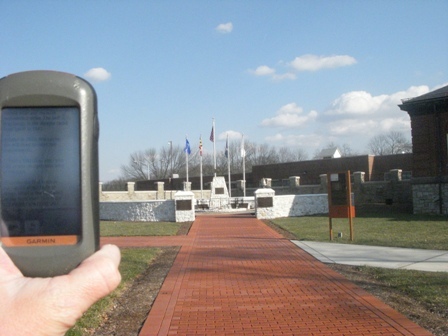 This virtual cache is located at the National Fallen Firefighters Memorial Park in Emmitsburg, MD. IMPORTANT: The park is located on the campus of the National Fire Academy, which is a controlled access federal property. Access will be restricted if the Terror Alert Level is raised to Orange (Severe) or higher. Upon arrival, you will need to show ID and may be subject to a random vehicle search. Be sure to view the preceding link for further information prior to your visit. When you arrive, let them know you are there for the Memorial Park, which is available from dawn to dusk. To many, when we hear "Civil Defense", we think of some outdated system from the 1950's and might bypass this memorial. Oddly, it is not even mentioned on the NFFF website. I am listing this virtual to encourage people to visit this memorial while they are here. FREE MEN MUST RE-DEDICATE THEMSELVES TO THE CAUSE OF FREEDOM. THEY MUST UNDERSTAND WITH A NEW CERTAINTY OF CONVICTION THAT THE CAUSE OF FREEDOM IS THE CAUSE OF THE HUMAN INDIVIDUAL. HUMAN INDIVIDUALITY IS THE BASIS OF EVERY VALUE – SPIRITUAL, MORAL, INTELLECTUAL, CREATIVE – IN HUMAN LIFE. FREEDOM IS THE RIGHT TO ONE’S SOUL; THE RIGHT OF EACH PERSON TO APPROACH GOD IN HIS OWN WAY AND BY HIS OWN MEANS. IT IS A MAN’S RIGHT TO POSSESS HIS MIND AND CONSCIENCE FOR HIMSELF. TO THOSE WHO PUT THEIR TRUST IN FREEDOM, THE STATE CAN HAVE NO SOVEREIGNTY OVER THE MIND OR SOUL – MUST BE THE SERVANT OF MAN’S REASON, NOT THE MASTER. 1. Please post a photo of the memorial or some aspect of it with your log. 2. 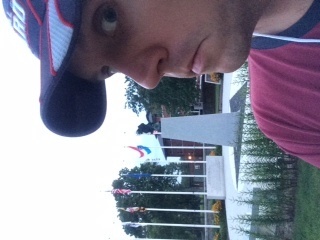 Log Password - When facing the memorial, look to your right. You will see a yellow pipe with an orange cap. The password is the 8 letter vertical word on the front, followed by the 3 character ID number the left side (letter-number-number). Enter the password in ALL CAPS with no dashes or spaces. As of the time of this listing, you will also have the opportunity to log other virtuals (on multiple sites) and a waymark while you are here. W 77° 19.810' ENTRANCE - I had trouble navigating to the site when I visited, so thought this would be helpful. Another impressive Memorial on the grounds of this cool closed in 1973 and merged with Mt. St. Mary's, College. I was a little worried walking over to this one, as the guys in the trailer can probably see you, and I had said I was only going to the Firefighters Memoral. Apparently I didn't take too many pictures, but I have one, albeit with no humans or a GPS in it. Thanks for the tour! I'm here on campus for the week and decided to grab all the virtuals while I had the chance. Thanks for hosting this. This was a neat memorial and I was almost going to skip it as I had stopped to get the Fallen firefighters memorial originaly but decided to give it a try while I was here anyway. I was running late at this point for the leaping lunch event and hadnt brough my camera today and left my phone in the car when I had gotten out to walk in the rain so at the end I headed back to the car and grabbed it but only snapped a picture at the firefighter memorial as I really was trying to make it to the event. Thanks for giving a little bit extra to this location to make getting past the gates more worth the trip. 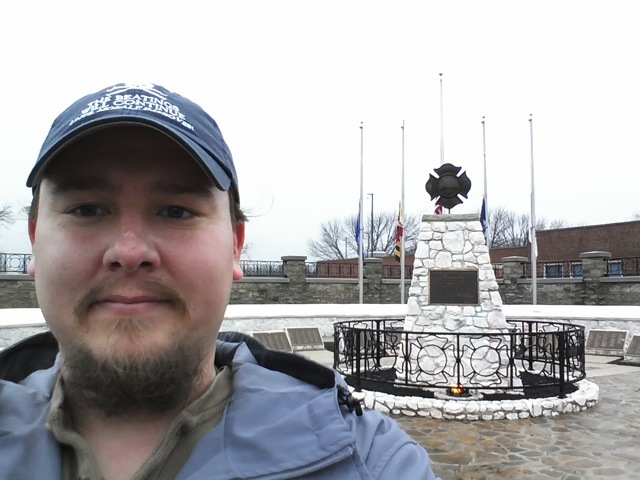 I finally got to come over and do the three virtual caches here. I had no problems getting in, just had to leave the pup in the car for a few minutes while I got my passwords and pictures. Thanks for bringing me here! I was in the area and wanted to stop by here to visit this location. This is a very nice memorial. Thanks for bringing me here to see it. I think today may have been the first time I've logged finds in 4 different listing services. Opencaching.us, Navicache, Terracaching and Groundspeak.